Madame Follette’s is a dressmaking shop located on Vine Street in London. The shop has seen better days, but the current manager, Felicity Dawkins, daughter of the shop’s founder, is determined to see that status change. All of London’s elite are preparing for the coronation of King George IV, an occasion that offers an opportunity to prove that Madame Follette’s dresses are superior to those produced by the city’s best dressmakers. Felicity is ably assisted in her efforts by two designers/dressmakers, Selina Fontaine and Delyth Owen. Felicity’s brother, Henry, serves as bookkeeper for the shop. Each of the novellas in this anthology centers around one of these four characters. “The Duke’s Dressmaker” by Madeline Hunter opens the collection. Selina Fontaine found a sanctuary as well as employment in the dressmakers owned by Sophie-Louise Follette Dawkins. Selina arrived in London, a gently bred girl who fled her village when a young aristocrat whose charm disguised his lack of integrity left her with broken promises and a stained reputation. Selina is wiser that she was when she left her village four years ago, and her instinct tells her to avoid her newest client, the young bride of Lord Giles Woodville, the man Selina had expected to marry. But loyalty persuades her that designing a wardrobe, including a coronation gown, for the lady is an opportunity for Madame Follette’s cannot afford to miss. However, Selina fears for the shop and for her livelihood when Randall, the Duke of Barrowmore, accompanies his sister-in-law to a fitting and recognizes Selina. The mistrust is mutual, but the attraction between Selina and the duke proves more powerful. As closer acquaintance corrects their false impressions of one another, their hearts rule their heads. 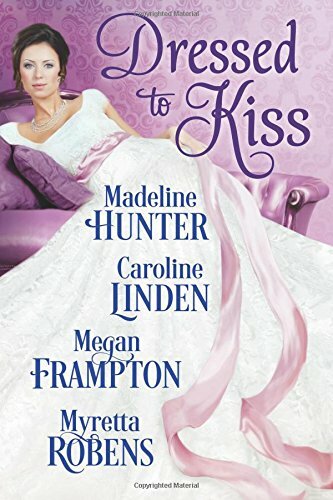 The road to an HEA is a proverbially rough one, but the conclusion to the tale is satisfyingly romantic. The novella may suffer in comparison to Hunter’s more complex novels, but her deft hand with characterization remains sure. “No Accounting for Love” by Megan Frampton features Henry Dawkins, a large, socially awkward young man, more at ease with the figures in his account books than with the figures of a dance. Henry is pursued by Lady Euphemia, a spoiled young beauty who is accustomed to getting what she wants. It seems that she wants Henry who has already rejected her once, but Henry, who is unmoved by the charms of the debutante, finds Miss Katherine Grant, the young lady’s companion, irresistible. Circumstances have forced Katherine to be practical. She may be the daughter of a viscount, but she is poor. She counts herself fortunate to have secured an acceptable position for a lady of her class that also provides for her needs and, given Lady Euphemia’s younger sisters, offers the promise of long employment. The same rules that limit her means of supporting herself also dictate that Henry is an unacceptable match for her, but the rules and Henry’s responsibilities which make marriage impractical prove inadequate barriers as these two unlikely people tumble into love. This was my favorite of the quartet. Frampton’s humor, sometimes sharp and sometimes subtle, kept me smiling throughout the reading, and I adored Katherine and Henry, separately and together. The fact that Lady Euphemia is more than an overindulged chit is a wonderful touch. My only complaint—and it is actually a testament to my engagement with the characters--is that I wanted a more detailed development of how these characters reached their HEA. The anthology concludes with “A Fashionable Affair” by Caroline Linden. As if Felicity Dawkins didn’t have enough trouble trying to restore Madame Follette’s to the glory it once knew, she must also contend with the Earl of Carmarthen who has already purchased all the other shops on Vine Street with plans to tear down all the worn buildings and build new, modernized shops in their stead. Felicity’s mother has steadfastly refused to sell, and at first Felicity refuses as well. However, once she realizes the inevitability of Carmarthen’s revitalization project, she agrees—but only if her conditions are met. Her primary concern is relocating the shop at a site that will ensure Madame Follette’s attracts the prestigious clients Felicity has been courting, and she and Carmarthen are in each other’s company frequently as they check out locations. The attraction that has simmered since their first meeting intensifies, but is an HEA possible for a woman in trade and an earl? Linden gives readers not a fairy tale in which lovers from different worlds ignore their differences but a satisfying romance in which the lovers recognize their different experience and perspectives and willingly take the risks. But, as with Frampton’s story, the ending came too soon. I wanted more of Felicity and Carmarthen’s story. The greatest strength of this anthology is that each of the stories succeeds on its own but the four work even better together. They are connected not only by setting, characters, and the plot line concerning Madame Follette’s but also thematically. Each of the stories is a cross-class romance on some level. Each romance also considers in some way the difference between appearance and reality and the need to move beyond the surface that serves as the base for society’s judgments. The words of Henry Dawkins in Frampton’s “No Accounting for Love” would be apt had they been spoken by any of the major characters: “But with her, he felt as though he were truly and entirely valued, for his outside, yes, but also for his inside.” If you think you don’t like anthologies, you may be surprised by how much you like this one. I highly recommend it. What a great review, Janga! I have been eagerly wanting to read this anthology and knowing these terrific authors, I am betting this will be a big hit. Thanks for sharing. Thanks, Connie. I think it is a winner. I hope you enjoy it as much as I did. Great - some authors I enjoy and some are new - always fun. They are all authors well worth discovering, catslady. I love anthologies like this! I like anthologies generally, Di, but I particularly enjoyed the fact that all these novellas were part of the same world. I love anthologies. This one features several of my favorite authors and sounds delightful. Thanks for the review. I look forward to reading it.